On Friday evening I shot the middle-fork of Bishop Creek and Lake Sabrina. 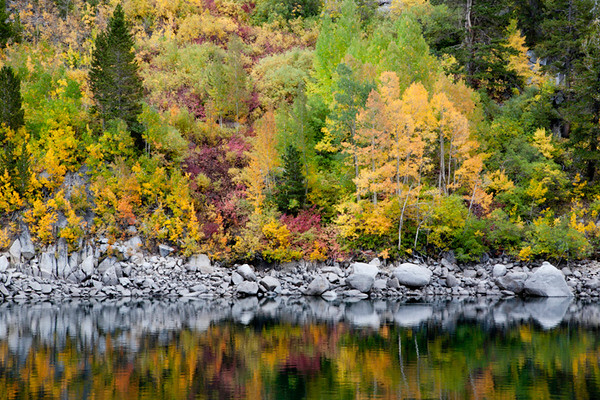 The fall colors bounced off the lake to good effect, but I struggled to find a suitable composition. The east side of the canyon has a large rock face with aspens, pines and other vegetation growing there. I found this particular area (on the left) with its red undergrowth appealing so I made it a point to cover it. Only later while viewing the shot on the computer monitor did I see the especially beautiful aspens next to it. That small area will get my undivided attention the next time I visit; a long lens will bring it to the fore nicely. Friday evening’s photo session of the middle-fork of Bishop Creek was completed at this scene; it was dark. I headed down to Bishop for dinner and a good nights sleep. I needed to rise early the next day to catch North Lake at dawn.